I was recently sent a pair of CW-X compression StabilyX pants to try out. 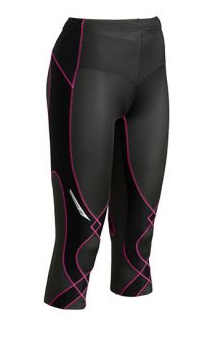 I didn’t think anything would feel better than the compression pants I have at the moment but these ones are great! I hadn’t actually heard of this brand but apparently they are available over here in Australia now and you can order from their website http://www.cw-x.com.au.. I ordered according to the sizing chart and got my pants in the mail and when I first took them out of the packet I was a bit worried as they looked like they would fit a 7 year old! I was even contemplating passing them onto my PT friend as they looked so small but when I tried them on I found they were very flexible but very tight – in a good way – I marvelled at my lovely looking behind as the pants pulled all my bits in – another bonus! It did however take a bit of grunting and pulling and bending to get them on but once on they were very comfortable. I also like that they aren’t low rising as normally, not being a skinny minny runner I get a nice little muffin top over the top of my pants and feel very self conscious when out running. The other great thing about these pants is that they have been designed with runners in mind and have a patented kinesiology support webbing to specifically target areas such as the hamstrings, hip flexors, ITB and back which is excellent for those of us with niggling injuries every now and again. I went for a run in them at lunch time today with the dog and I have to say they were very comfortable and I had no problems with them and I felt a fair bit of support on my knees which was good. The only thing I could potentially say is a down side is that the fabric is quite thick and if you are someone who feels the heat like I do these would probably be your winter tights rather than summer as the fabric is quite thick – awesome for when it is cold but not for our Queensland summers! Although they do have a UV protection rating of UPF 40+ – but just a bit thick. They do do more of a short than a capri so they may be more suitable for this time of the year. I did the MCM 10K last year in the CW-X full length tight. They were wonderful and I has very little soreness the next day.